Hypoglycemia is a glucose management problem and there could be many causes. It is easily managed. 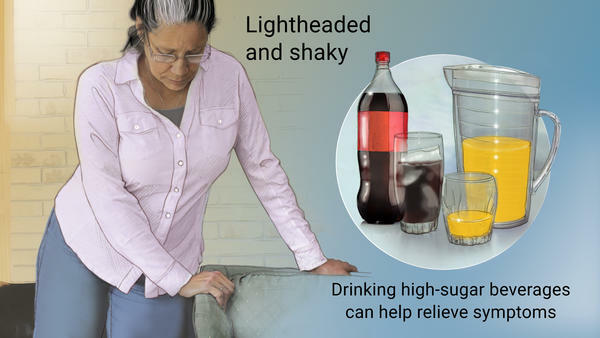 Such a condition may cause problems with weight gain, and sugar craving as well, but a hypoglycemic person will be at low risk for heart disease or adult onset diabetes. An adult onset diabetic has too much glucose (sugar) in his or her circulatory system. Hypoglycemia is rather the opposite problem; there is not enough circulating glucose. However, the cause is not insufficient dietary glucose. Sugar craving is part of unmanaged hypoglycemia, and it is likely that too much sugar and starch is taken. The problem has more to do with how the body regulates sugar. Recall from this post, or this one, that one of the many purposes of insulin is to regulate the amount of glucose in the bloodstream to a target value of around 75 mg/dl. This is not a lot of sugar, perhaps a teaspoon in your five quarts of circulating blood. Maintaining this level is important, as the brain runs primarily on glucose. Muscles will use it too, but prefer fat. After consumption of sugar or starch (both these end up as glucose) the levels of glucose in the blood will sharply increase. The body secretes insulin in response to this. This insulin signals the muscles to run on sugar for a while so as to get the excess level down. If there is a lot of sugar, the insulin signals the fat cells to take it up too, converting it to fat for storage. Ideally the increase in insulin will quickly bring the glucose back to its ideal level. This does not always work right. If a person takes too much sugar and starch, the insulin response may be unable to bring the glucose level back to normal. This condition of chronically elevated sugar, along with insulin, is the hallmark of adult onset diabetes. Hypoglycemia involves the opposite problem. In hypoglycemia, the body seems to have an itchy trigger finger on the insulin gun. As soon as there is just a bit of extra glucose, it blasts the sugar with both barrels of insulin. This clears the glucose just fine, but overdoes it and doesn’t leave enough in the blood, thereby creating a lack a couple of hours later. That lack translates to a craving, which, if satisfied, restarts the cycle, and if not, leaves the person in a low energy state. This pattern can be troublesome. There is a specific standard test for hypoglycemia. If your fasting insulin is very low, or if the above symptoms fit, you may well be hypoglycemic. You can get the test done and see. Hypoglycemia can be genetic, caused from bad diet, or due to other causes. However, it is easily managed. Eating six to eight small meals a day of good nutrient rich, low sugar and low starch food will cure, or at least manage hypoglycemia regardless of the cause. In fact, if you follow our dietary advice, given here, there is little point to the test. The diet will cure hypoglycemia whether you have it or not. But bear in mind that you must eat the six meals. (Three meals + three snacks. Do not “graze.”) Otherwise your glucose will sag between meals and you will crave sugar and be miserable. You may need more meals, but smaller ones. If you are hypoglycemic, there are both benefits and increased risks. The risks generally come from the insulin blast that forces the glucose out of the bloodstream. In a normal person, dietary glucose is first used to top-up a storage of glucose in the liver called glycogen. It then tops up a similar glycogen stores in the muscles. What’s left over after all this, if any, will typically get stored as fat. However in hypoglycemia, the intense burst of insulin forces the sugar into all three simultaneously. The net effect is that some sugar is stored as fat, even though the liver and muscles could have used that glucose. Similarly, the liver and muscles don’t get as much glucose as they need. Within a couple of hours, that glucose will run low, and a caving will develop. If the craving is satisfied, the new sugar or starch is again stored as more fat, and the cycle begins afresh. If the craving is not satisfied, the person is left in a low energy state. With insulin rather low most of the time, cell renewal will be slow, which will increase aging and make it hard to build muscle. So hypoglycemia is a lose-lose-lose proposition. There is a plus side. Low circulating sugar typically means a lower risk of heart disease, and by definition, means a lower risk of adult onset diabetes. (Adult onset diabetes is defined as a chronically high circulating glucose.) Oddly though, the cravings associated with hypoglycemia can eventually lead to a diabetic state if the cravings become overwhelming. It is possible to have your cake and eat it too. Just kidding. No cake. But you can keep the benefits of low circulating sugar while avoiding the sugar craving and low energy periods. If the six to eight small low or no-sugar and lowor no-starch meals are taken, blood sugar will stay in the safe zones, the cravings will disappear, and because of the low sugar and starch, the blasts of insulin will be avoided along with the fat storage. Weight will typically be lost, often quite rapidly, and sugar cravings will cease as well. All of the body’s numerous metabolic hormones and circulating biochemicals will come into harmony. If coupled with proper exercise and a destressing program, a very high degree of health will be maintained.